The Milwaukee County Law Library (MCLL) located in the Milwaukee County Courthouse is seeking candidates for a Library Associate Limited Term Employment (LTE) position. The MCLL is a branch of the Wisconsin State Law Library. This position is approximately 16-24 hours a week between the hours of 8:00 AM and 4:30 PM, Monday, Wednesday, and every other Friday. Willingness to work flexible hours is extremely important. Hourly wage is $14.70/hour. Duties include assisting library users in person and on the phone, processing new materials, filing and shelving library materials, assisting with maintenance of the judges’ print collections, and maintaining equipment and supplies. Highly qualified candidates will have excellent customer service skills, cash handling experience, be able to work independently, manage and complete projects on time, and be able to follow directions. This would be a great position for someone interested in a library or legal career. Enrollment in a library program is preferred. To be considered, submit a cover letter and resume by e-mail clearly stating your qualifications and the days/hours you are available to Jennifer.Haas@wicourts.gov. Applications will be accepted until the position is filled. No phone calls please. The Wisconsin Court System is an affirmative action/equal opportunity employer and will provide reasonable accommodations to qualified applicants who request them. There's still time to sign up for our two free, CLE-credit classes on How to Research Legislative History. Learn how to research law sources, drafting files, budget bills, and Supreme Court rule orders in these free classes. The first class is offered on Wednesday, June 14th. Wednesday, June 14, Noon - 1 p.m. I need the legislative history of a Wisconsin statute. Where do I start? What do I do? Get answers to these questions and more by attending, Researching Wisconsin Legislative History: Sources and Strategies. Participants will look at the primary resources used to research Wisconsin legislative history, navigate the online Wisconsin legislative drafting files, and learn some helpful tips and tricks along the way. Wednesday, July 12, Noon - 1 p.m. I need the legislative history of a Wisconsin statute. Where do I start? What do I do? 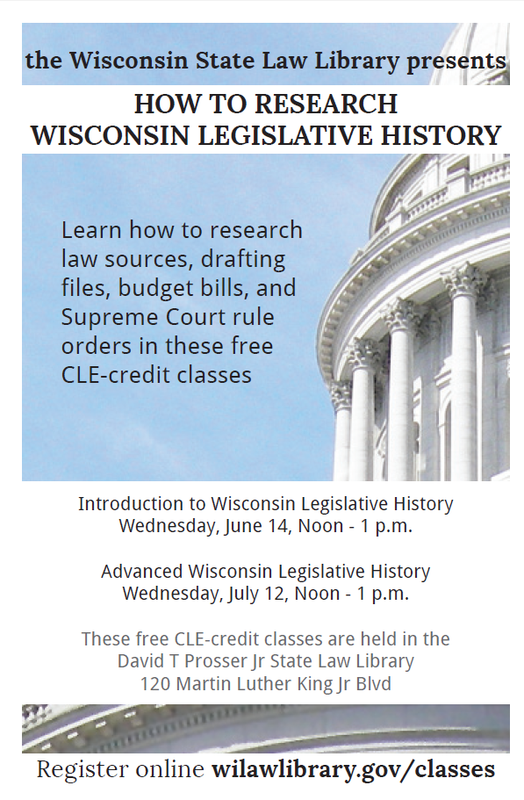 Participants will look at the primary resources used to research Wisconsin legislative history, learn about the online Wisconsin legislative drafting files, and learn some helpful tips and tricks along the way. This advanced class covers additional search strategies, budget bills, advanced use of drafting records, and Supreme Court rule order research. Thursday, July 6, Noon - 1 p.m.
FREE. 1 CLE credit. Registration is suggested through the Milwaukee Public Library and space is limited. Call 414-286-3011 to register. These are demonstration classes. The June 2017 issue of WSLL @ Your Service is now online. As always, your comments are welcome. Please direct them to the editor, Kristina Martinez.